The clearance of landmines and explosives from his farm allowed this farmer to thrive. My name is Phouk Nil and this is my farm. This red and white post shows the boundary of where APOPO and their partner, The Cambodian Mine Action Center (CMAC) where searching for landmines on my fields. During the war I was a soldier fighting the Khmer Rouge. When I returned to my farm everyone told me to be careful of the landmines that were lying hidden in the ground. They said that my fields must have some in them because they were everywhere. In the war I saw many nasty things, and landmine injuries were one of them. Landmines are designed to maim soldiers not kill them, so the soldiers are slowed down to look after each other. They are easy to make and hide. Then the soldiers move on and the landmines are just left there forgotten. Until someone steps on one, most likely a person working in a field, or walking along a path to get water. Landmines have injured many, many, people in Cambodia. A lot of injuries are to women and children who are working to help their families survive. In this field we suspected landmines but we had to keep on working. We occasionally found old unexploded bombs and we would actually move them very carefully to the side of the field. Last year a tractor drove over an anti-tank landmine. This is a huge explosive device. Everyone died and the tractor was split in half. That landmine had been there for 30 years. It made us very scared, because we plough these fields every year, but we had to keep on working. 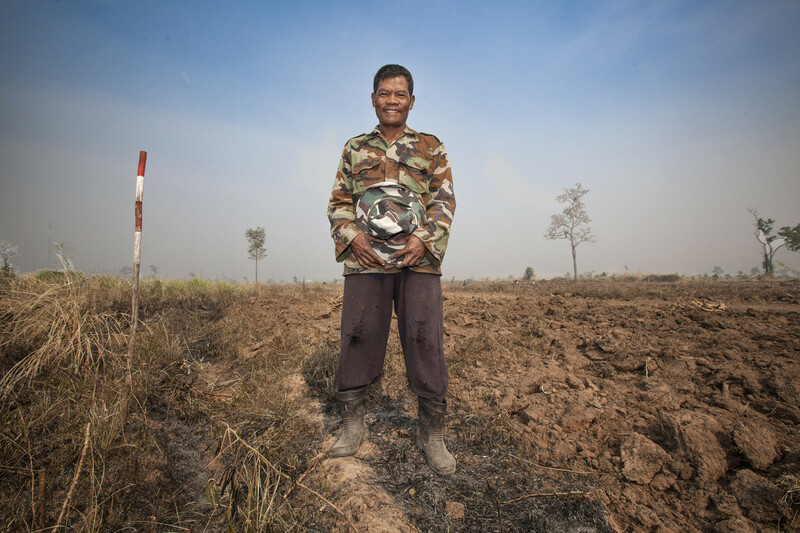 When APOPO and their partner the Cambodian Mine Action Center (CMAC) arrived, they took a week to clear my field and found six homemade landmines that were still live. For so long we had driven, ploughed, and dug right next to them but never hit them. I can’t explain how that feels, or the relief we felt when we were told the fields are now safe. I expanded my field immediately and employed six workers and more part-time. Now instead of planting for survival, I am a businessman who supplies vegetables for market and to other farms for animal feed.